A quiet morning stroll down Beijing Street turned into running away with a crowd of Tibetans as an empty PLA convoy pulled through. Maybe 100 meters further there was a massive crowd of Tibetans surrounding a narrow alleyway. As it turned out, they were throwing stones and abuse at PLA soldiers who were blockading the passage to a monastery. . . .
A new American-style fast food restaurant named Dicos had just opened up this year on Youth Road. 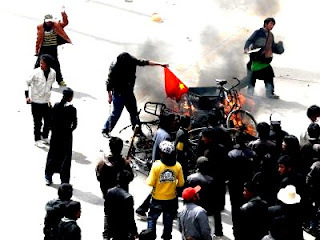 Several dozen Tibetan youth regarded that this was their main target. Of course, they were not going to spare the stores around it either. They threw rocks and applied force continuously. Behind them, the police tried to stop them without much effect. . . .